Every year, people come up with a New Year’s resolution to help improve on their life. 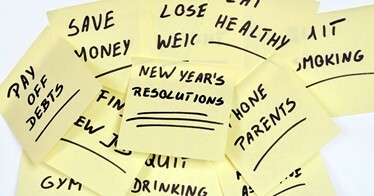 In most cases, these resolutions revolve around creating a healthier lifestyle. However, more often than not, the resolution is abandoned before the end of the first month of the year. Sometimes, sticking with a resolution takes up more time than people have to offer. Luckily, there’s a few resolutions that you can partake in throughout the year that are simple and won’t require you to give up too much time. These resolutions will help you lead a healthier lifestyle too and will ensure you feel confident about starting fresh in the New Year. So, get ready to have some fun as you don’t have to wait to try out these ten ideas. We live in a society that really promotes materialism, which causes our lives to be filled with clutter. It has been scientifically proven that clutter actually makes you feel worse than you should, which is a good reason to find some time to declutter. This is especially true after the holidays as we accumulate so much stuff that it’s hard to make space for it, at times. This doesn’t mean you have to go through your entire home and get rid of everything. Instead, take a look around a single room each day and choose an item that doesn’t bring you joy. If it’s something that is useless to your life, then donate it or recycle it to make something that will improve on your life. You may find that some of the things you’ve thought were important really aren’t. After time passes, you will feel like your home has less clutter, which will help relive some anxiety. If you aren’t comfortable with getting rid of some items, then box them up. You can always revisit them in 6 months to rotate them with some of the items you do have out. This will help ease you into the transition. Gardening is one of the most relaxing things you can do in your life. However, in the winter it is nearly impossible to garden in most areas. So, you might want to start planting and caring for seedlings. You can do this in many ways. You can buy supplies to plant the seedlings in specific planters, or you can use items from around the house, like KCups to plant your seeds. These seeds can be placed on the windowsill during the day, so they get plenty of light without being exposed to the cold. When spring comes, they will be ready to be replanted outside. These plants will also grow into healthy fruits and vegetables, which will help you accomplish your healthy eating goals. Getting in shape can be a huge challenge. However, the way many people go about workouts can really work against their progress. More often than not, people will buy a workout machine or dedicate their efforts to running and other simple exercises. After some time, doing this can get pretty boring, which is often what detours people from carrying on with it. By exploring workouts, you won’t just be able to freshen up your exercise routine, but you will also learn what your body enjoys doing. This will also give you a wider range of things you can do to suit a variety of workout needs. For instance, you can find something that is great for strength training, cardio and peace of mind. You also might find something that truly brings you joy. The more you try, the better off you will be. When the Chinese New Year arrives, it is traditionally considered to be lucky to begin the New Year with a clean home. You might want to adapt this principle into your own New Year celebration. Cleaning the home is a good way enjoy a fresh new start to the year. Although surface cleaning is a great place to start, you might want to think about some of the areas that might not get cleaned as often. For instance, you may want to see what the back of your refrigerator looks like. Cleaning this area won’t just help with your power consumption and the functionality of your appliance, but will prevent fires too. Another great thing to do is swap out the air filters for the New Year. This simple and quick change will give you fresher air that will make you feel healthier and more comfortable. You’ve probably heard that practicing mindfulness is one of the best things you can do in order to improve our world’s poverty crisis as well as to improve the environment. However, it isn’t always clear how you can practice mindfulness in your every day life. There are actually numerous ways you can do this though, which can make a huge difference with very little effort on your part. For starters, when you go to buy a brand, all you have to do is make a quick internet search to learn more about it. Many brands use child labor, pay poor wages or practice animal cruelty. You might also want to look up brands that are doing their part to help combat global problems. For instance, Cheerios is working to help save the bees. After looking up some brands, you might actually feel the need to consume less, which will certainly save you money. Of course, you can practice mindfulness by creating less waste too. Use recyclables for crafts, storage and more. Try not to take plastic bags from grocery stores. Shop at stores that allow you to purchase items without packaging. It doesn’t take much to make a huge difference in the world. One major problem with today’s world is we are always connected. This might be a great year to take some time for you by unplugging from technology for an hour or so. You can do this once a day or week to help work on yourself. When you power down, you should use the time to focus on your health. Try reading a book or writing in a journal to help boost mental function without being in front of a screen. You might also use this time to work out, enjoy a hobby or play a board game with the family. No matter what you do, make sure there is no technology on around you. It might be tough at first, but after doing this a few times you may feel more relaxed and at peace with yourself. For more people, saving money is a resolution that isn’t just a want but a need. However, as time passes, it gets increasingly hard to save money. From spontaneous meals out with friends to the new pair of shoes you have to have, it might begin to seem impossible to make the savings you resolved to. There is one way that you will at least put back a little during the year. That is, to create a savings jar. You may want to begin pulling out cash each week to pay for your lunches, drinks and more. Whenever you have change from these transactions, simply place it in the jar. You will be surprised as to how fast it fills up. If doing this isn’t an option, then you might want to make it an incentive jar. For instance, if you would like to stop swearing then place an amount in for each swear word you say. Soon, your bad habit will be in check and you’ll have money saved up. Getting rid of bad habits is one of the top resolutions around. For instance, smoking, eating out and getting coffee from a café each day, can really harm your health and your budget. That is why it is one of the best ways that you can start the New Year out on a fresh note. Generally, bad habits are what hold many people back in life, so by working to get rid of one of yours you will be broadening your horizons while opening up new options. For instance, quitting smoking will give you a lot of extra money to play with and it will improve your quality of life. Soon, you won’t have to think twice about going for a run or even enjoying a movie without having a nicotine craving. Eating out can be curbed too, which will give you more money for healthy meals while helping you lose weight and feel healthier. There’s a few tricks to help you curb the habits, so check out a little research to see what works best for you. It doesn’t matter how old you are, one of the best ways to start your year out well is to dedicate time to furthering your education. This doesn’t mean you have to dive into a calculus class if you don’t want to. Instead, find something you’re interested in and look for a course to satisfy this need. You have a lot of options to choose from when it comes to classes too. For instance, you can take a cheap course at your local college. If you can’t afford to do this then look online to see if you can find a free course to work with. There are so many ways to satisfy your needs even if you don’t want to take a course. For instance, you can check out a text book at your local library or look up tutorial videos on how to do certain tasks. By choosing a learning method that suits your needs, you’re sure to grow immensely during the New Year. Making a fresh start for yourself doesn’t have to be an expensive or time consuming endeavor. With these ten tips, you should be able to find the perfect way to help you make the changes you’ve hoped for without making you feel hopeless. Soon, 2018 will be your most successful year yet, thanks to your dedication to change.